Read Testimonials from our Kansas City Home Theater Systems Clients! “We contacted Darren with CINEMA AT HOME when we were going to remodel our basement. We ended up hiring him to do our home theater We got more than we expected with Darren. He ended up working very closely with the general contractor to make sure everything was exactly the way we wanted it. My wife and I had no idea what was involved with doing our home theater with an additional tv built into our bar area. Darren was extremely patient answering all of our questions and also making sure to manage our budget for the project. I was amazed at the amount of time he spent to make sure the room was laid out correctly, from exactly measuring where all of the speakers should go to how all of the wiring looked inside the cabinet. Once the room was ready for Darren to come in and install the system, he never seemed to be in a rush to get thru with the project. It took him almost a week of making sure every system was working correctly. I could tell that it was very important to him that we were pleased with the final product. Darren has stayed in contact with me to make sure the system has been working correctly. Since he has done our system we have recommended him numerous times to our friends and neighbors”. “CINEMA AT HOME integrated several components including three LCD HDTV’s, multi-gaming systems, iPod Media Docking Station, multiple HD receivers, Wet-Bar audio system and a Home Theater featuring HD projection and eight channel surround sound system. The best part is the one touchscreen remote control that allows each component to work seamlessly and separately on any of three TVs and projection system that they installed in my basement. 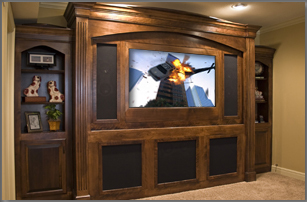 The eight channel surround sound is simply amazing; not to mention the high definition video image projected onto a 100″ electric screen that drops down out of a custom built cabinet when we are ready to have a true big-screen cinematic experience! Jim C., Overland Park, KS. In the Greater Kansas City area? Get your Free In-Home Consultation & Estimate Today! 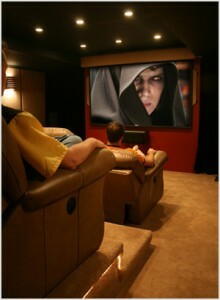 CINEMA AT HOME offers FREE, No-obligation, In-home Consultations. Call 913-515-2081 or schedule a Free Consultation using our Online Form. 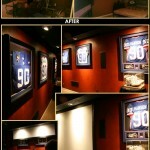 Offering Home Theater & Custom Electronics Integration services to the Greater Kansas City area. If Walls Could Talk . . .
© 2019 Cinema at Home. 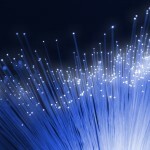 Site Design & Development by Apple Marketing.